If you have any questions regarding ORG policies and processes, or if you just have general questions, don’t hesitate to contact us or make an appointment with one of our staff members for more information. 8 a.m. – 5 p.m., Monday through Friday (during the academic year). Please note that most ORG staff members are students, so hours could vary based on students’ academic schedules. Hours also vary during breaks and over the summer. 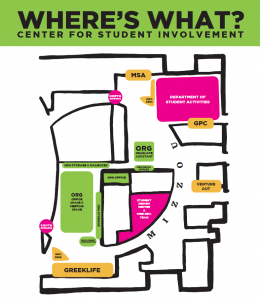 The ORG office is in the Center for Student Involvement on the second floor of the MU Student Center, in room 2507R. See the map below for the location of our office and other places you may need to visit.